On A Roll: Is M Burger the best fast-food hamburger in the city? It’s finally “watching the wheels” time here in Chicago. We’ve been granted a full string of sunny warm days, almost a full three months earlier than last year. Of course, this is the Midwest. It may snow yet, so grab it while you can. I’d recommend some al fresco eats to enjoy the weather, but that would just be a critical disservice, for everyone knows, al fresco in the Windy city means choking on the curbside dust kicked up by street sweepers running as a function of still relatively inefficient aldermanic prerogative. Better instead to head over and grab and go from M Burger, the new shake shack from Lettuce Entertain You, and spread out in some off-street plaza in the Loop. I know. I’m sick of the burger thing too. But hear me out. The reason we’re sick of it is that, though the neo-burger movement is supposed to be a concession to bad economic times, ambitious restaurateurs can’t help themselves from serving beef from grass-fed cows massaged and showered with craft beer by geishas on artisan buns baked by French midgets. As a result, we’re paying two or three times what we used to pay. Plus, the chefs, being chefs, can’t stop laying in the purple river salt harvested by mermaids during the full moon, or the foie gras and truffles, when all we really want is a little McDLT, cool side cool, hot side hot action. And yet, though it’s under the watchful guidance of Scott Barton, chief handler of Jean Joho of Everest and Laurent Gras of L2-where-did-my-dough-go-O, and it’s housed in an old part of the TRU kitchen, a spot where you can drop a mortgage payment on a Lucite staircase of caviar and accoutrement, M Burger somehow gets that. It’s not the best burger in the city. Though who knows what that is anymore, for Kuma’s and their impossible lines have fallen prey to the tree falling in the forest thing, i.e. if they make the best burger, but you have to wait three hours to get one, does it even exist? Top Notch and Schoop’s and Edzo’s are awesome … well actually I don’t know if Edzo’s is awesome since it’s in Evanston and I live in the West Loop and have been too lazy to get there, but my guys, no, not the overrated Five Guys, tell me it’s awesome. Anyways, you get it, they’re far away. Marc Burger at Macy’s of all places has been sweet, but it’s closed in the evenings, isn’t that cheap, and isn’t always consistent. On these other counts though—proximity, value, accessibility and decent taste—the M Burger is spot-on. Though the Tribune’s Phil Vettel says he recently lost five pounds walking from the Tribune Tower to M Burger only to be intimidated by the line and then walk back again. A little advice, Phil: trust me, get in the line. It moves faster than a Portillo’s drive-through worker jacked up on Red Bull and cocaine. The signature M Burger is like a Filet-O-Fish, Big Mac and Wendy’s Bacon Cheese Single all rolled into one, which is to say, it’s got a pillowy bun (you could sleep on it—though it would likely wilt under drool) like the Filet, a tangy secret sauce like the Mac and a nice fresh grill-marked and juicy patty like Wendy’s. Unlike Wendy’s, the bacon isn’t Smurf-sized fast-food micro-bacon. It’s relatively plank-like. My only quibble is that the grain here seems a little machine-tight and packed, and after a night of drinking beer in the back of a limo with his shirt off, Patrick Kane might mistake the patty for a puck. The patty is also light on the super-beefy flavor you get at the high-end: score one for geisha-massaged cows. 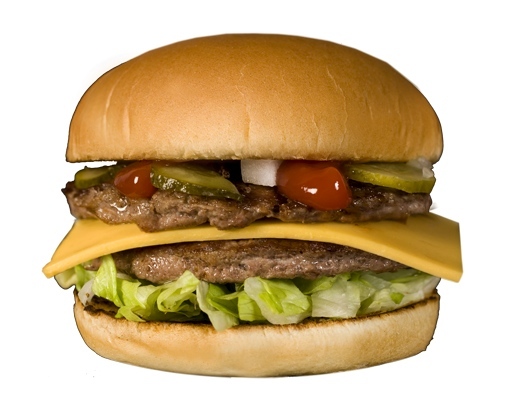 All that being said, it’s probably the best fast-food burger in the city. And since it’s been two years since I’ve had an In-N-Out, it might be just as good or better (please come here and prove me wrong) than an animal-style slider from the mighty West Coast super-chain. Like In-N-Out, there already seems to be a secret menu at M Burger, as I noticed folks ordering triple patties when only double were advertised. I dream that there’s a hidden Tramonto-style option whereby the burger is served on top of a fish bowl housing a live goldfish. Fries were hot, crisp and salty with nice minor bits of skin. And, taking down Superdawg as my favorite quick shake of late: the M Burger strawberry milkshake was filled with real bits of fruit and milk from a local dairy. I also kind of like the sort-of decision on the “Nurse Betty” (read veggie burger), to eschew genetically modified vegetable-enhanced soy patties in favor of a thick old slice of tomato, pickles, onion and avocado. I likely will never order it again, but that’s what God made vegetarians for.